← Five minutes with… Adam Irelandes. “Who takes off their shirt to celebrate in Sunday league? F***ing W***ers.” – Unnamed Gustav Hurricanes player. “He’s not offside, it’s the parallax effect, Sir” – Bjorn Burgher. An extremely flat performance by the Herston Hatchets nevertheless saw them run out 4-1 victors over the Gustav Hurricanes. Despite never really getting into their rhythm, the Hatchets did enough to see off a spirited challenge from the team which has been described as ‘the most Scottish in the league’. It was always going to be difficult for the Hatchets players to get motivated for this match, which was widely perceived as an easy three points, after their tough battles against QUT and Naita Phoenix last weekend. To make matters worse, several Herston players have been taking part-time university courses (presumably with one eye on a life after football) and this game fell the morning after their exams. As players began to arrive at Prentice Park Arena, many still sweating out the previous night’s imbibements, die-hard spectators were left wondering as to how the team was even going to put eleven players together. 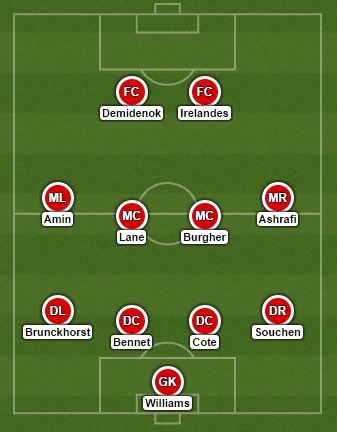 Several changes were made to the Hatchets starting eleven. The biggest change for Herston was the return of Alex Cote to the team, along with comebacks for team stalwart Toby Brunckhorst and hard-man Drew Williams. Adam Irelandes lined up for his last game this season. It was an emotional moment as the perpetually-tensing winger ran through his guard of honour and onto the field (Editor’s note: Yes, he is actually going to Africa. Luckily for the children he will be teaching in a Ghanaian classroom, this isn’t a joke). The match began in extremely lacklustre fashion. Midfield pressure was almost non-existent, with both sides preferring to let the incredibly uneven pitch do the majority of the hard running for them. It was a strategy that paid off throughout the 90 minutes, as passes became increasingly difficult to control. The opening goal was a wake-up call to Herston. A corner for the Hurricanes was swung in to the far post, where it was headed back towards goal. Both Hatchets goalkeepers were wrong-footed, with Drew Williams unsighted, and Darius Ashrafi only able to get his fingertips on the shot. At 1-0 down, the intensity was palpably increased. The proud young men from Herston were forced into action, and their response came in the form of an excellent goal. A chip over the top from Tom Souchen found Ashrafi sprinting down the right-hand side. The ‘Boy from Bangladesh’ played a tantalising ball across to Jenya Demidenok running in at the far post, who made no mistake in finishing underneath the keeper. Not long afterwards, it was Souchen who again created something out of nothing. A lofted pass to the massive-calved right back was headed on towards goal. However, seeing that no Herston player was in a position to chase his through ball, Souchen decided to sprint after it himself. Showing good pace, he reached it before the sorry Gustav keeper and finished into the bottom-right corner. It is worth mentioning at this juncture that this was the first time Souchen’s girlfriend had come to watch him play. It was also probably Souchen’s best performance of the season. Whatever your name is, oh mystery woman, please come back soon. The second half continued in much the same vein as the first. Irelandes, clearly desperate to score in his farewell match, cut inside from the right and shot well with his left foot, only to see the ball smash back off the crossbar. Pierre-Nicholas Boyer, who normally prides himself on his ability to keep shots down, fired well over from not very far out. However, the reprieve didn’t last long for Gustav. Brunckhorst played in a cross from the right towards Sonesh Amin, who controlled with his chest and created space for a shot. Although his effort was saved, Boyer was on hand to make amends by rifling a volley into the roof of the net. In the 85th minute, the game was over as a contest when Herston scored yet again. Alex Cote showed both ‘quick feet for a big man’ and ‘a cultured left foot’ by beating his opponent on the edge of the area and then squaring the ball for Irelandes to tap in. It was easy to see the delight on the striker’s broad face as he ripped his shirt off and sprinted the length of the pitch to celebrate. Asked after the game whether his celebration was worth the yellow card, Irelandes replied: “Yes”. The final whistle finally blew after an extremely lethargic closing stanza. Herston now stretch their unbeaten run to four games, which will surely give them momentum heading into the last few games of the season. This entry was posted in Match Reports and tagged gustav hurricanes, match report. Bookmark the permalink.